We present the Korea Institute for Advanced Study Value-Added Galaxy Catalog, a catalog of Main galaxies based on the New York University Value-Added Galaxy Catalog Data Release 7 (NYU VAGC; Blanton et al. 2005). The catalog supplements redshifts not in the Large Scale Structure (LSS) sample (brvoid0) in the NYU VAGC from other existing galaxy redshift catalogs such as the Updated Zwicky Catalog, the IRAS Point Source Catalog Redshift Survey, the Third Reference Catalogue of Bright Galaxies, and the Two Degree Field Galaxy Redshift Survey. The catalog also provides morphological type and related parameters which are measured by an automated morphology classification scheme of Park & Choi (2005), together with fundamental photometry parameters supplied by the NYU VAGC and zero-indexed position in data of Max Planck for Astronomy (MPA) & Johns Hopkins University (JHU) Data Release 7 to match to their spectraum measurements. Therefore, the KIAS VAGC is complementary to the NYU VAGC and MPA-JHU catalog. This catalog is described in a paper pusblished in Journal of the Korean Astronomical Society. Citations Please cite this paper for users of the KIAS VAGC and acknowledge the use of SDSS data and NYU-VAGC, in your publications. Contact Please contact Yun-Young Choi with comments or questions. The KIAS VAGC contains 593,514 redshifts of the SDSS Main galaxies in r-band Petrosian magnitude range of 10<rP<17.6. We excluded 929 objects in the LSS Sample (583,946 galaxies) that are in error (e.g. badly deblended by automated photometric pipeline, blank fields, or stars, and so on) and added redshifts of 10,497 galaxies with 10 < rP<17.6 (1,455 with 10<rP<14.5) not in the brvoid0 LSS Sample whose selection criterion is found here. The data of angular selection function includes a fraction of targets which successfully get redshifts in a sector for all the sectors. This file also describes the geometry of the sample and bright star mask. Figure The angular selection function of the NYU VAGC LSS catalog is displayed in the upper panel and one after supplementation of 10,497 galaxies in the lower panel. After the supplementation, the main area with the angular selection function greater than 0.97 increases from 39.8% to 54.3% of the area with the selection function greater than 0. The area in black denotes bright star mask. Our catalog includes the morphological information of all the galaxies. We use the automated classification scheme developed by Park & Choi (2005) using u-r color, Δ(g-i) color gradient, and the inverse concentration index cin measured from Atlas images of all the galaxies in our KIAS VAGC. Reliability and completeness of this classification reach about 90%. To improve the automated classification results, we performed visual inspection together with thirteen astronomers on the selected 83,292 galaxies that are located in the ``trouble zones'' where the reliability of the automated classification is low. 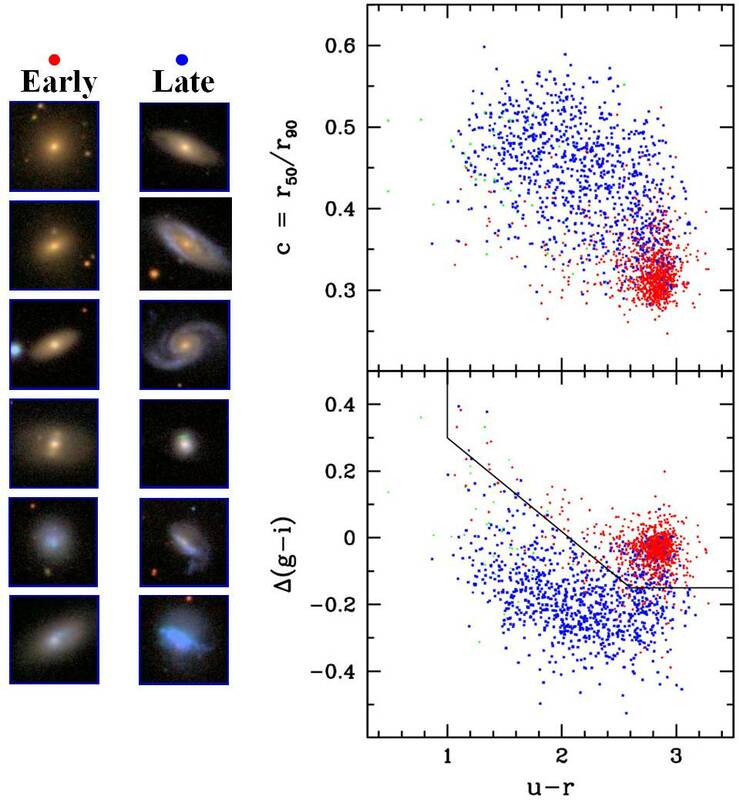 These are the galaxies having neighbors at very small separations (for these cin is inaccurate) or those classified as blue early types or red late types. As a result, the morphology of 7% of the inspected galaxies is changed and some spurious objects are removed. The data of morphology classification includes redshift and morphology related parameters we measured, together with the other fundamental photometric parameters of the NYU-VAGC. 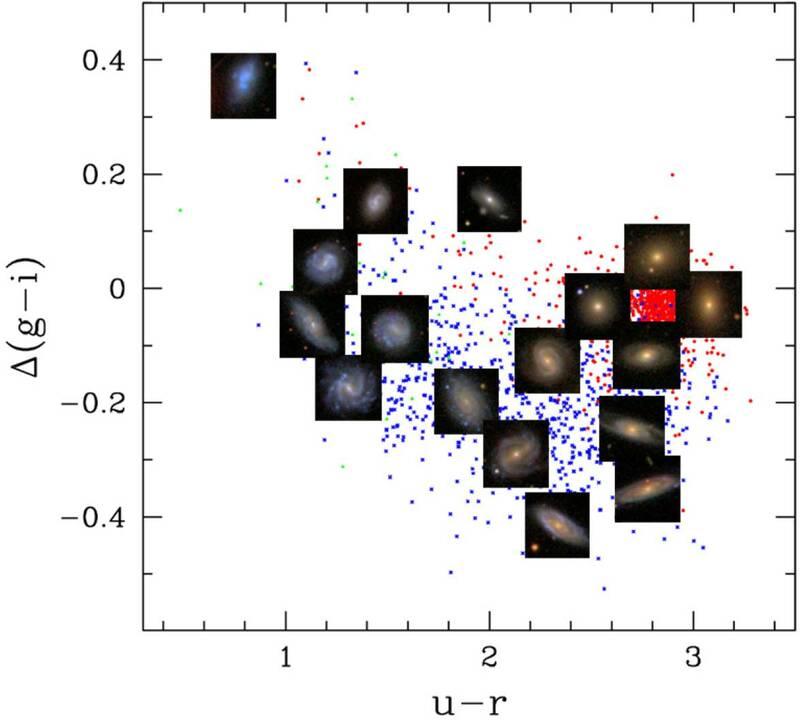 The morphology information given by the scheme has been used in the several studies on the relation between galaxy properties and the environment (Choi et al. 2007; Park et al. 2007; Lee et al. 2008, 2010; Park, Gott, & Choi 2008; Park & Choi 2009; Park & Hwang 2009; Choi, Woo, & Park 2010; Lee et al. 2010; Han et al. 2010) and the topology of large scale structure (Choi et al. 2010; Zhang, Springel, & Yang 2010). The KIAS VAGC also provides a file containing information to uniquely identify an spectroscopic observation. The data of SDSS spectral information is given in a format of ASCII. We acknowledge the NYU VAGC team and the thirteen astronomers who joined the eyeball inspection of the galaxy morphology (Changbom Park, Pravabati Chingangbam, Ho Seong Hwang, Young-Rae Kim, Pascale Hibon, Graziano Rossi, Hong-Bae Ann and his students, Kwang Ho Lee, Hyunbae Park, Do-Gyun Kim, and Danny Pan). Funding for the SDSS and SDSS-II has been provided by the Alfred P. Sloan Foundation, the Participating Institutions, the National Science Foundation, the U.S. Department of Energy, the National Aeronautics and Space Administration, the Japanese Monbukagakusho, the Max Planck Society, and the Higher Education Funding Council for England. The SDSS Web Site is http://www.sdss.org/. The SDSS is managed by the Astrophysical Research Consortium for the Participating Institutions. The Participating Institutions are the American Museum of Natural History, Astrophysical Institute Potsdam, University of Basel, Cambridge University, Case Western Reserve University, University of Chicago, Drexel University, Fermilab, the Institute for Advanced Study, the Japan Participation Group, Johns Hopkins University, the Joint Institute for Nuclear Astrophysics, the Kavli Institute for Particle Astrophysics and Cosmology, the Korean Scientist Group, the Chinese Academy of Sciences (LAMOST), Los Alamos National Laboratory, the Max-Planck-Institute for Astronomy (MPIA), the Max-Planck-Institute for Astrophysics (MPA), New Mexico State University, Ohio State University, University of Pittsburgh, University of Portsmouth, Princeton University, the United States Naval Observatory, and the University of Washington.